Christianity was persecuted. I'm not sure how this would've effected books made during Jesus's time or shortly after. That "stories" about Jesus were written years after Jesus's death has always been a hearsay and rumor but I've never seen any concrete evidence specifically proving the earliest available books were the FIRST books. Good point Kenny. If Jesus had physically written a book or books of the Bible, an autobiography so to speak, there would be no problems at all. Nobody would deny that Jesus wrote it. Nobody would deny Jesus existed. Nobody would deny that Jesus is God. That would've been so much different than the way it is now! I don’t see how one can deny that Jesus existed or that he’s God. And basicallly it is him who wrote the Bible inspiring it through his spirit. Hence the Word of God.. is Jesus. For me it’s very real. The proof is there. Those who don’t see it just don’t want to. What I don't understand, is how someone who believes Jesus is God, doesn't show Jesus the proper respect He deserves, by capitalizing the H in He, when referring to Jesus. The Holy Spirit inspired the whole bible. Just like the prophets it’s all God I’m the doing. The body is just used for the mouth or hands in this case. To what degree and exactly what it means that the HS inspired the writers of the various books, poems, songs and letters that make up the bible, is hotly contested. The inspiration and inerrancy of scripture is absolute. What is contested is the interpretation. Some believe that the writers were inspired to write by the HS BUT that the writers had autonomy on HOW to write ( but now WHAT to write). Some believe that the HS showed the writers what to write ( divine revelation). Some believe that the HS "took over" the writers and they ( the writers) were simply the "vessel" ( the pen and ink if you will). Some believe that the ONLY the parts that explicitly say they are inspired ( parts that say, " The Lord said..."). People may not understand or get this BUT the written word was valued LESS in ancient times than oral transmission and that is the reason you would only get a written account towards the end of the life cycle of the people that witnesses the actual events. The writings ( recognized) we have about Jesus are all written within a generation of His death ( circa 30AD). This is what we would expect ( as the apostles and direct witnesses were passing on what they saw and experienced) and also very, very good compared to the writing we have from other historical figures ( most of those accounts written generations after their deaths). The question really is, why would Jesus write anything down? How many Rabbis were there? How many Scribes? And those Jesus knew he was disgusted by, and such revolted against Him and had Him crucified. At the end of the day, all things in retrospect, was there a reason for Christ to lift a pen straying from what His claim to fame purpose was supposedly about? (I say supposed, as I place myself obviously in the shoes of the non-believer). There was none. Presumably. Christians, true believers in Christ, are strong even unto death in the face of the likes of ISIS to this day. Jesus was to be focused upon His purpose, HIS PURPOSE, and that alone -- assured, even knowing, that what was to be necessarily recorded WOULD BE. That's all the was needed. As for the original question. Kenny, what is supposedly the point getting at? That Christ didn't exist? Fat bloody chance. Sorry. That's just stupid, retardary. So what is it that's at the back of your mind. That's a more interesting question. At least, for me in trying to understand a once-believer turned unbeliever as yourself. I think it’s well established that God as only used and still using only people who are “willing vessels”. Of course, God never overrules free will. What is debated is the degree of influence of the HS. Why debate it ? God only use willing vessels therefore only if they are willing to do his will and write the Bible as he wills it to be then the Holy Spirit will come on a person and make it happen. Yes, that's how I know "retardary" when I see it. 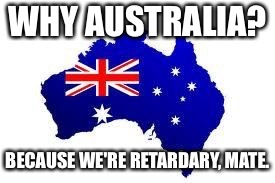 Because I'm surrounded by a lot of bloody retards here in Oz! Just ask Mrs K, she'll tell you the same. Hang on... actually don't ask her. Plus, remember, it wasn't immediately evident to some people that Jesus was the Messiah.